They also have attained rare equality in their workplace. It's a 50-50 composition of men and women in the 30-member front office of full-time employees. "A normal minor league baseball team might have one to two women in their front office. We are different," said Jonathan Griffith, the Blue Wahoos team president. "Gender really doesn't matter for us. It's more about finding the right people to fit our culture." With vice president Donna Kirby, chief financial officer Amber McClure, and human resource director Candice Miller leading the way in executive positions, women have been a powerful part of why the franchise has attained so much success. 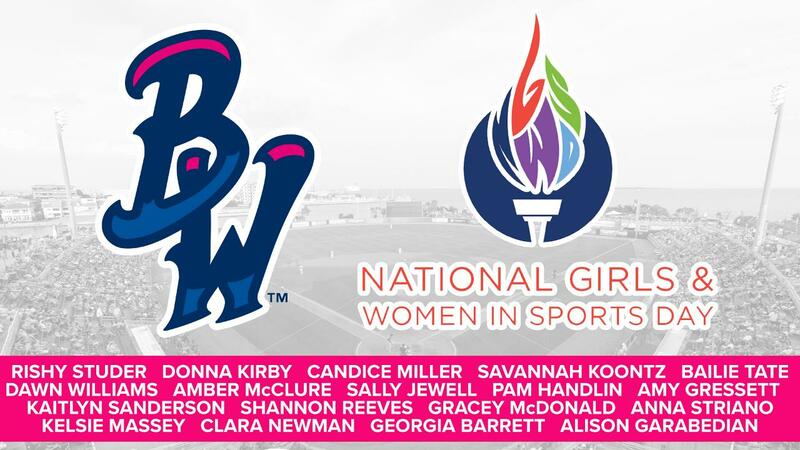 As the nation recognizes the 33rd annual National Girls and Women in Sports Day on Wednesday, the Blue Wahoos are a proud reflection of advancement. "Coming into this industry as a 21-year-old, fresh out of college, it was kinda intimidating," said Gracey McDonald, season ticket concierge. "But walking into an environment where there are so many powerful women, all these wonderful women who surround us every single day and strive to be the best people in this office, has been great," she said. "Especially when 30 years ago, it was something that was basically unheard of. "To have these women as role models to mold people like us into future leaders in sports has been really inspirational." In their own sporting past, the women in the Blue Wahoos front office were soccer players and swimmers. Softball players and cheerleaders. Volleyball players, competitive dancers, drum corps, and color guard members. "It just says to me we have come a long way," said Candice Miller, human resources director for the Blue Wahoos and the Studer Family of Companies. "Women are being heard, they are being valued for what they bring to the workplace. "I think transitioning to working in sports has helped a lot when you are already were involved while playing a sport," she said. "You take the values and everything you learned working with other people and trying to connect the ball in soccer, working together that way, you then transition it over to working here. "Leadership, teamwork, all different aspects of sports transfer into this role. "I think the transition from high school sports to college and then setting your career path led me to realize I wanted to stay in sports somehow," said Striano, who majored in sports management at Grand Canyon University in Phoenix, Ariz.
"I definitely think being a member of a team at such at young age, it really does lay that foundation of what positive teamwork looks like and how to be a good leader. "I think those are skills that each of us rely on every single day we are here. I know how to work as part of a team and how to lead people. "Working for a company that celebrates women and encourages us to do better things is really inspiring." "I have been a baseball fan as far back as I can remember," said Kirby, a University of California-Long Beach graduate. "Having a firm knowledge of the industry has come in handy more times than I can count. "I feel like, because of that, I have been able to adapt, learn, grow and coach where needed in the Blue Wahoos organization. It is a complete bonus I got to work in a sport I love so much. "I am involved in many women's leadership groups and it's inspiring to see young women beginning their careers in the sports industry. The Blue Wahoos are very open and supportive working with emerging female leaders." McDonald played club volleyball for the West Florida Revolution (now the Waves) and three years as volleyball player at Milton High. "Playing sports growing up gives you the central skills you need to be successful in your career field." "I randomly got a job here just because I did not want to stay at my other job," said McDonald, a UWF graduate. "And I quickly found a love for sports I didn't know I had. "I think being specifically with the Blue Wahoos has given me such a wonderful taste in the sports field that I now have grown to love. I don't see myself leaving the sports field." "It has made the transition easy," Williams said. "I am a team member, always have been. So to get to an organization that works as a team is fantastic. "It is amazing to see that we were accepted into the front office in more roles than just my role… that we are viewed as equal. That is big in a sports role and it was something unheard of not long ago." Handlin played volleyball in high school in Kansas City, but primarily because, "we did not have a girls basketball team back then." "I think the involvement in sports at that young of age really developed leadership skills in me that I had no idea were there," she said. "And, of course, some self confidence too. "I think that has allowed me to embrace different role for different companies. I think the involvement in sports when I was young really helped build the base for my choice as an adult." "It teaches you how to be a team player even though swimming felt like a one-person sport. But you are a team and it prepares you for knowing that it's not all about you… that always other people are involved and working together to come to a common ground." "It just doesn't have to be a male dominated world and the influx of women in sports has allowed women in business in the sporting world. It has opened the doors." "I think the perseverance and courage it has given me have been beneficial as well as my leadership skills. I was always in position of leadership in the color guard. "Seeing so many women elevate in sports business has been great. We can do it. I know we can do it. And it's now just great that everyone gets to see that." "When I retired from swimming, I was looking for a new team, because that's what being part of sports has meant to me… it's being part of a team. "There are so many possibilities and potential for women in the sports industry right now and this is just the beginning." An Ohio native, who grew up in Pensacola, Miller played softball in the Myrtle Grove youth league. "I think it allowed me to understand the sport," said Miller a Pine Forest and Pensacola State College graduate. "But where I got the majority of my knowledge and learning was from raising a child who played baseball from the time he was 3-years-old until now. "I have a love for baseball. I was always a Cleveland Indians fan from being born in Ohio. I never thought I would end up in minor league baseball, but I think it was a way of (baseball) seeking you out and finding you. "Women are getting the chance to do things they love and are passionate about." "I think it builds character and morale. It taught me how to appreciate the sporting environment and how lively and energetic it is. "I would say (women) are setting the tone in sports business and it shows there can be a respectful environment in the workplace regardless of gender, which is nice."